Want to learn more about Color Theory? 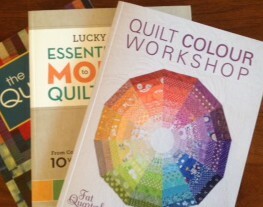 Many of the available books suggest that the first step is to make a color wheel! Don't have all the colors on hand? No worries! We are planning a swap for the next two meetings! That way everyone could have all the colors of the spectrum to build a color wheel! Please bring what you can swap of the above colors to the September 9th meeting. Choose prints from your stash that read like solids. If you have it in your stash, please bring - light - medium - dark - values of the color. Don't worry if you don't have all the colors! The plan is to swap for the colors you need to complete your color wheel. What size fabric should you bring? If you would like to make the color wheel quilt pictured at the top of the post, swap size is 2.5" x 7"
Please keep in mind that you will need to purchase the book to make that color wheel quilt. If you have another design in mind for your color wheel, bring your fabric and plan to cut it at the meeting when a swap has been agreed upon. See you next Tuesday at Twill! Very excited about this! Should the fabric be cut into strips or swatches or just brought in whole amounts? Hi Nancy! Just sent out a group email detailing all the options. Let me know if you have any further questions!